India being an agricultural country, the analysis of rainfall variability and seasonality is important due to their tremendous influences towards agricultural water use. Changes in seasonality of rainfall may have substantial impacts on agro-economy of the country. In addition to the agricultural production, changes in rainfall seasonality may damage the dynamic ecosystems. Besides, due to the increased phenomenon of natural disasters, information about the temporal variability of rainfall is crucial for water resource management and planning. Variability of rainfall may be defined as the degree to which rainfall amounts vary across an area or through time. It is an important characteristic of the climate of an area. On the other hand, seasonality assesses the seasonal contrasts in rainfall amounts, but not dryness or wetness in an absolute sense [1Livada I, Asimakopoulos DN. Individual seasonality index of rainfall regimes in Greece. Clim Res 2005; 28: 155-61. [http://dx.doi.org/10.3354/cr028155] , 2Barry RG, Perry AH. Synoptic climatology; methods and applications. London: Methuen 1973.] stated that it is possible to define regions with similar precipitation patterns by seasonality indices estimated using harmonic analysis. Now-a-days it is very much essential to know changes in mean seasonal rainfall from stream discharge, flood forecasting, etc point of view. Such changes greatly affects the runoff, evapo-transpiration, infiltration and hence the agricultural behavior of the region. This changing pattern in rainfall can be investigated by seasonality index (SI) of rainfall. The relative seasonality of rainfall represents the degree of variability in monthly rainfall throughout the year [1Livada I, Asimakopoulos DN. Individual seasonality index of rainfall regimes in Greece. Clim Res 2005; 28: 155-61. [http://dx.doi.org/10.3354/cr028155] , 3Walter MW. Length of the rainy season in Nigeria, Nigeria Geog J 1967; 10: 127-8.-5Walsh RPD, Lawer DM. Rainfall seasonality: Description, spatial patterns and change through time. Weather 1981; 36(7): 201-8.]. Therefore, changes in seasonal pattern of rainfall and identification of changes in SI are essential for agricultural planning. Much attention is currently being directed at the possible impacts of global warming and induced regional climate change essentially for agricultural planning. This concern, in particular, is one of the main reasons for the research presented in this paper, which searches for evidence of changes in rainfall seasonality: changes in monthly rainfall distributions during the ‘average’ year over the 34 meteorological sub-divisions. Large numbers of studies are available on temporal and spatial distribution of rainfall using daily rainfall data. On the basis of monthly rainfall data of fixed network of 1476 rain gauge stations (i.e. one station per 3402 sq.km area) [6Adejuwon JO. Rainfall seasonality in the Niger Delta Belt, Nigeria. J Geogr Reg Plann 2012; 5(2): 51-60.] 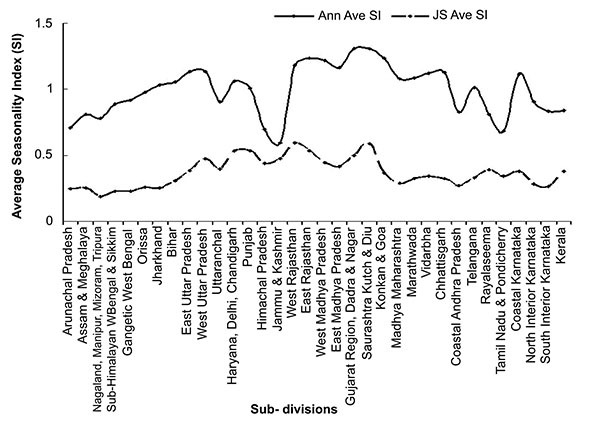 carried out linear trend analysis for the period 1901-2003 over different subdivisions of the Indian region. Their analysis revealed that during the monsoon season, three subdivisions viz. Jharkhand, Chattisgarh, Kerala showed significant decreasing trend and eight subdivisions viz. Gangetic WB, West UP, Jammu and Kashmir, Konkan and Goa, Madhya Maharashtra subdivision, Rayalseema, Coastal AP and North Interior Karnataka showed significant increasing trends. They also noticed that the contribution of June, July and September rainfall to annual rainfall is decreasing for few subdivisions while contribution of August rainfall is increasing in few other subdivisions. While studying the district rainfall climatology of the Maharashtra state [7Guhathakurta P, Rajeevan M. Trends in the rainfall pattern over India. Int J Climatol 2007; 28(11): 1453-69. [http://dx.doi.org/10.1002/joc.1640] ] showed that there is great variation in seasonality index (SI) over different regimes. SI was more than 1.2 in coastal areas (Konkan sub-division) indicating the extreme rainfall region with heavy rainfall in one to two months. Just east of this sub-division, SI varied from 1 to 1.2 indicating rainfall region where most of the rain occurs in less than three months time. The central part of the state experienced rainfall in all the four monsoon months with SI less than 1.0 which is good for agriculture. The further detail studies made by [8Guhatakurta P, Saji E. Trends and variability of monthly, seasonal and annual rainfall for the districts of Maharashtra and spatial analysis of seasonality index in identifying the changes in rainfall regime, 2012; Research Report No.1/2012, IMD Pune Publ. 1-26.] regarding change in seasonality index (SI) of rainfall in Sangli district of Maharashtra showed that SI of annual rainfall for different stations in Sangli district is in the range of 0.87 to 1.04 showing that most of the rainfall occurs in less than three months with a long dry season. SI of monsoon season varies from 0.0665 to 0.3529 resulting in rainfall spread throughout the year, but with a definite wetter season. On global scale, in the past, based on vector analysis [9Patil MK. Change in Seasonality Index of rainfall in Sangli district. India Streams Res J 2015; 5(1): 1-7.] proposed a quantities technique for measuring precipitation seasonality. Spatial distribution of precipitation seasonality in the United States was studied by [10Markham CG. Seasonality of precipitation in the United States. Am Assoc Geogr 1970; 60: 593-7. [http://dx.doi.org/10.1111/j.1467-8306.1970.tb00743.x] ]. The nature of the seasonality of precipitation in eastern and southern coastal Spain was examined using 410 sites monthly precipitation values for the period 1964-1993 [11Finkelstein PL, Truppi LE. Spatial distribution of precipitation seasonality in the United States. J Clim 1991; 4(4): 373-85. [http://dx.doi.org/10.1175/1520-0442(1991)004<0373:SDOPSI>2.0.CO;2] ]. The results showed that seasonality is increasing in the south (Andalucı´a), around the uplands of Catalunya (near Lleida) in the east, and in a few smaller areas in between. SI calculated using mean monthly rainfall data for the Greece [12Sumer G, Homar V, Ramis C. Precipitation seasonality in eastern and southern coastal Spain. Int J Climatol 2001; 21(2): 219-47. [http://dx.doi.org/10.1002/joc.600] ] varied from 0.212 to 0.860 dividing the Greek area in to four regions of rainfall variation. On the basis of 1930 to 2002 gridded data, the changes in SI over the tropics were analysed [13Kanellopoulou EA. Spatial distribution of rainfall seasonality in Greece. Weather 2002; 57(6): 215-9. [http://dx.doi.org/10.1256/004316502760053576] ]. The study revealed an increasing trend in SI indicating an alarming condition of shifting of time in plant activities, distribution and composition of ecosystem with consequences of water and water and water resource man agents in future. 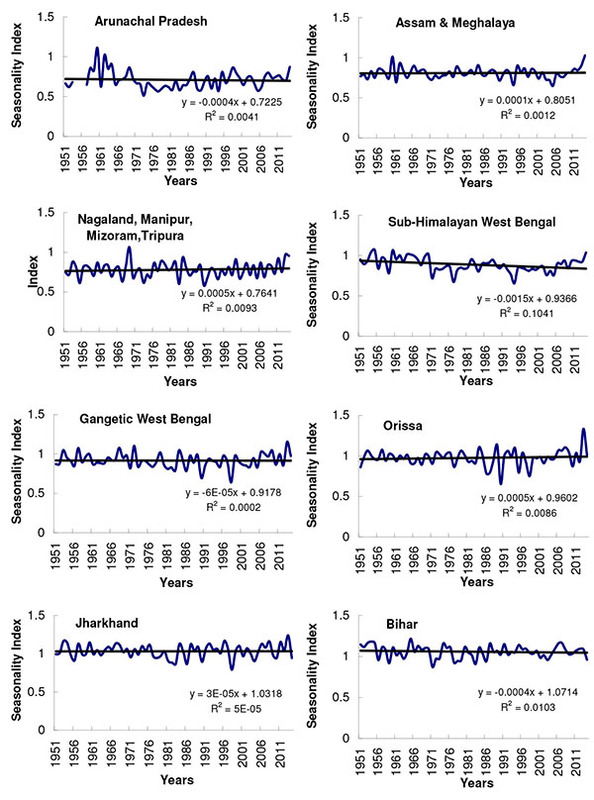 Rainfall seasonality and variability for the northern part of South-Asian country, Bangladesh was analysed for 1964 to 2013 [14Feng X. Porporato A, Rodriguez-Iturbe I. Changes in rainfall seasonality in the tropics. Nat Clim Chang 2013; 3: 811-5. 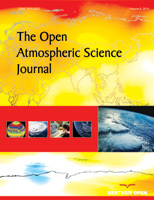 [http://dx.doi.org/10.1038/nclimate1907] ]. By applying Mann-Kendall trend test and sequential Mann-Kendall test to determine the trend in seasonality, they found that the mean individual SI varied from 0.81 to 0.98 indicating that the rainfall in Bangladesh is markedly seasonal with a long dry season. Therefore quantification of monthly rainfall distribution of different areas can be done using seasonality Index. Temporal and spatial patterns can be useful to know the year to year variation in rainfall and long term changes in rainfall seasonality. The current study mainly focused on the broader aspect of seasonality in rainfall distribution using monthly and annual rainfall of 34 sub-divisions of the Indian region for the first time. The study has also aimed to determine whether there are any changes in seasonality during 65 years period. India is a seventh largest South Asian country having diverse terrain giving the country a distinct geographical entity. It is bounded by the Great Himalayan ranges in the north; it stretches southwards and at the Tropic of Cancer, it has a narrow peninsular region bounded by the Indian Ocean in the south between the Bay of Bengal on the east and the Arabian Sea on the west. The diversity in the Indian rainfall distribution is mostly because of four major geographical regions – a) the Great Himalayan range in the north, b) the Indo-Gangetic plain along the foot hills of Himalayas, c) the desert regions in the northwest and d) the Deccan Plateau and Peninsular region in the south. The physiographic features of these regions play major role in determining the Indian climate varying from temperate and alpine in the northern Himalayas to tropical in the southern India. The country’s climate is strongly influenced by the Himalayas and the Thar desert in driving the summer and winter monsoons. The four major climate groups are – a) montane, b) subtropical humid, c) tropical dry and d) tropical wet. The important characteristic of the Indian climate is related to the seasonality and variability of rainfall. About 80% of the annual rainfall is received during the monsoon months of June to September (mid May to mid October in some areas). Due to uneven distribution of rainfall, some regions experience severe floods and some drought conditions. Therefore intensity and duration of rainfall play major role in rainfall variability over the country. In addition, researchers also feel that rainfall amounts and its seasonal distribution might have changed over the past few decades which are mostly concerned with the urbanization, industrial development leading to environmental changes too. The present study highlights the changes in seasonality using average monthly and annual rainfall during 1951 to 2015. Considering the varied climate over different regions, entire Indian region has been divided into four major sections viz. 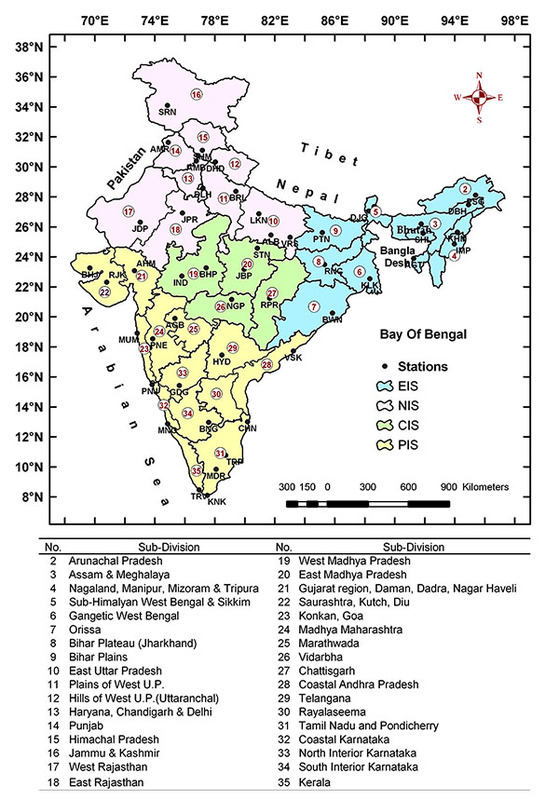 a) EIS- Eastern India Section, b) NIS – North India Section, c) CIS – Central India Section, and d) PIS – Peninsular India Section. These sections constitute 36 meteorological sub-divisions for research purpose Fig. (1 ). In the present study, 34 sub-divisions inside the Indian region are considered excluding two island sub-divisions. To compare the variation of different sets of observations (e.g. annual and seasonal rainfall) about their mean, the coefficient of variability (CV) is a useful parameter. CV is a relative measure of variation that explains the deviation in data series from its central tendencies [15Bari SH, Hussain MM, Husna N-E. Rainfall variability and seasonality in northern Bangladesh, Theo and App 2016; 1-7. [http://dx.doi.org/10.1007/s00704-016-1823-9.] ]. The coefficient of variability is found by expressing the standard deviation as a percentage of the mean value [16Singh RB, Mal S. Trends and variability of monsoon and other rainfall seasons in western Himalaya, India. Atmos Sci Lett 2014; 15: 218-26. Where, CV is the coefficient of variation, S.D. is the standard deviation, and is the mean. The spatial variation of rainfall seasonality is further examined using the seasonality index derived by [4, 12Sumer G, Homar V, Ramis C. Precipitation seasonality in eastern and southern coastal Spain. Int J Climatol 2001; 21(2): 219-47. Where, Xnk is the rainfall of month n of the year k and Rk is the total annual rainfall for the year k.
Four major sections and 34 meteorological sub-divisions of the Indian region. Theoretically, the SI can vary from zero (if all the months have equal rainfall) to 1.83 (if all the rainfall occurs in one month). The qualitative classification of degree of SI is given in Table 1. Although SI is computed using all 12 months rainfall data, the rainfall over the region shows seasonal pattern only when SI is more than 0.6. The higher the seasonality index of a region, the greater is the variability in water resources and scarcity in relation to time, and therefore the area can be more vulnerable to desertification. Fig. (2a ) shows the average annual rainfall for the Indian region during 1951-2015. There is clear distribution of maximum rainfall over west coastal region below 20°N and eastern sub-divisions in between 88°E to 97°E. Average annual rainfall varies between less than 300 mm over West Rajasthan to above 3500 mm over coastal Karnataka. Since 80% of annual rainfall is received during monsoon months of June to September, there is not much difference in the spatial distribution Fig. (2b ) of annual and seasonal rainfall except there is decrease in magnitude of rainfall for sub-divisions, Punjab, Haryana and Chandigarh, Bihar, Rayalseema, Tamil Nadu, etc. Spatial distribution of a) Annual rainfall and b) Jun-Sept. rainfall during 1951-2015. The coefficient of variation in rainfall during four different seasons, viz. winter (Jan- Feb), pre-monsoon (Mar-May), monsoon (Jun-Sept) and post-monsoon (Oct-Dec) is showed in Fig. (3 ). The highest variation is observed in Saurashtra-Kutch & Diu during all the seasons. The next higher CV was recorded by Konkan & Goa, coastal Karnataka sub-divisions. during winter monsoon months (Jan-Feb.). During post-monsoon season more variation in CV was noted by Punjab, West Rajasthan and Saurashtra-Kutch & Diu. These variations in CV determine the changes in SI. Variation in CV during winter, pre-monsoon, monsoon and post-monsoon months. It is generally said that a month which significantly contributes more or less than 8.33% to annual rainfall determines the SI of that region; to be dry or wet [11Finkelstein PL, Truppi LE. Spatial distribution of precipitation seasonality in the United States. J Clim 1991; 4(4): 373-85. [http://dx.doi.org/10.1175/1520-0442(1991)004<0373:SDOPSI>2.0.CO;2] ]. However, it is seen from Figs. (2 and 3 ) that almost all the rainfall is associated with monsoon season and therefore subjected to a considerable degree of seasonality. This may have an impact on the agriculture activities of a region. 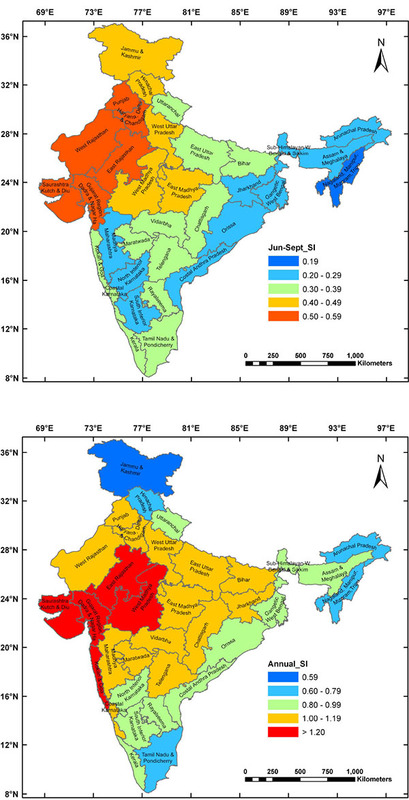 As stated earlier, this study focused on analyzing the variability and seasonality of rainfall in 34 sub-divisions inside India. At first, individual seasonality index was calculated that provides information about the inter-annual variations in seasonality and then, mean individual seasonality index was calculated. Variability in SI was measured using the coefficient of variability. All the sub-divisions receive most of the rainfall during monsoon months with varying time period. Therefore, SI (monsoon) value varies from 0.19 over Nagaland- Manipur-Mizoram-Tripura sub-division Table (2) in the extreme east to 0.59 over West Rajasthan in the extreme west. The mean monsoon rainfall varies from 261.55 mm (over West Rajasthan) to 3090.07 mm (over coastal Karnataka) Figs. (4a & b , 5 ). The SI values over these sub-divisions are 0.59 and 0.38 respectively, indicating rather seasonal rainfall with short dry periods. Average annual and Jun-Sept SI with maximum and minimum SI values for 34 sub-divisions (1951-2015). However, annual SI values vary from 0.59 over J&K sub-division to 1.31 over the two sub-divisions; Gujarat Region-Dadra & Nagar Haveli; Saurashtra-Kutch & Diu (Table 2, Fig. 5 ). This shows that rainfall over J&K sub-division is seasonal but with short dry periods whereas Gujarat Region-Dadra & Nagar Haveli; Saurashtra-Kutch & Diu sub-divisions receive rainfall only in two months of monsoon season. This is mostly due to the CV during monsoon season is higher than annual CV over these sub-divisions (Figs. 4a and b ). Overall CV over all the sub-divisions is to the higher side during monsoon season than in annual rainfall as annual rainfall is contributed by northeast monsoon rainfall in northeastern and eastern peninsular sub-divisions. From Table 2 it is seen that 14 sub-divisions recorded SI between 1.0-1.19 indicating that most of the rainfall occurs in less than three months over these sub-divisions. The maximum SI value (> 1.20) recorded by five sub-divisions, viz. East Rajasthan; West Madhya Pradesh; Gujarat Region-Dadra & Nagar Haveli; Saurashtra-Kutch & Diu and Konkan & Goa Fig. (6 ) also show extreme seasonality over these sub-divisions. Many a times these sub-divisions experience heavy rains just in one or two months during the monsoon season. The lowest SI value of 0.59 over Jammu & Kashmir indicates that the rainfall over this sub-division is purely seasonal. This rainfall is rather generated by local convection due to western disturbances at higher elevations along with the synoptic scale systems moving at the foot hills of Himalayas. Seasonality Index was computed for all the 34 sub-divisions inside the country for the entire period 1951-2015 as well as for two different periods, viz. 1951-2000 and 2001-2015 in order to know whether there is any change in SI during the last 15 years and previous 50 years period Fig. (6 ). The year to year variation in SI showed that there is noteworthy increase in SI values after 1991 on annual scale with extreme seasonality in 2013 across east coast sub-divisions of India whereas year 1991 was more seasonal in west coast sub- divisions. SI and total variability in a) annual rainfall and b) Jun-Sept rainfall. Average annual and Jun-Sept Seasonality Index (SI) over meteorological sub-divisions. 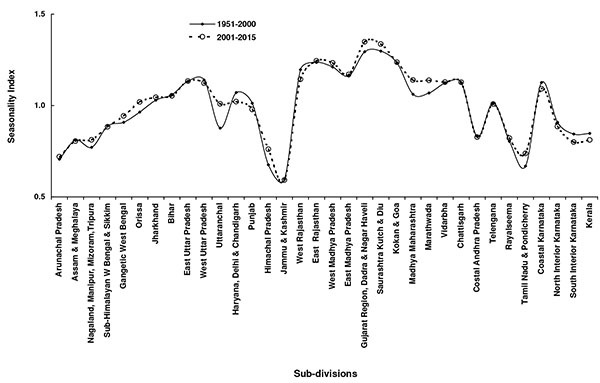 Variation of SI during 1951-2000 and 2001-2015 for 34 sub-divisions. The SI values showed considerable annual and spatial variability over the sub- divisions. Its variation through the study period is shown in Fig. (7 ), averaged for each sub- division, with increasing or decreasing trend along with the R2 values. The graph shows notable year to year oscillations in all the sub-divisions showing significant positive or negative trend in the index. The sub-divisions which indicate positive trend showing increase in SI are Uttaranchal, Himachal Pradesh in north Indian region, Gujarat Region-Dadra & Nagar Haveli; Saurashtra-Kutch & Diu, Konkan & Goa, Madhya Maharashtra, Marathwada, Chattisgarh, Tamilnadu & Pondicherry of peninsular Indian region. An increasing trend may therefore, indicate increasing aridity during the monsoon period. The negative trend in SI values was observed in Sub-Himalayan West Bengal, Haryana-Delhi-Chandigarh, Punjab, J & K, West and east Rajasthan, coastal Andhra Pradesh showing increasing wetness for an already wet months although rainfall occurs in a very short period of just a month or two. 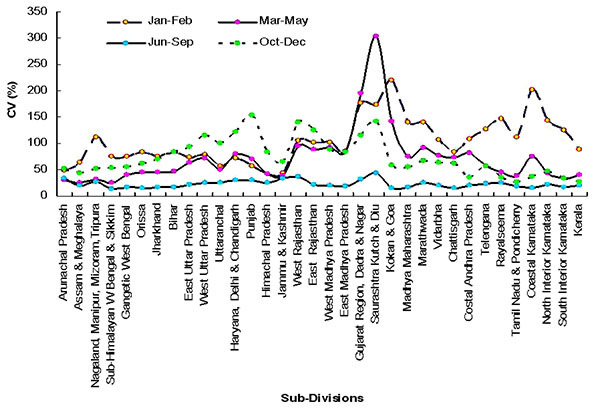 Year to year variation in seasonality index for 34 sub-divisions of India. The comparison of SI during two different periods showed that there is not much difference in SI values but there is noteworthy increase in SI values of Gangetic West Bengal, Orissa, Uttaranchal, Gujarat region, Saurashtra and Kutch region, Madhya Maharashtra, Marathwada and Tamilnadu sub-divisions Fig. (7 ). The northeast monsoon rainfall is relatively of low intensity but it affects annual distribution of rainfall and therefore annual SI. The spatial distribution of SI for annual and Jun-Sept is shown in Fig. (8 ) for comparison. Spatial distribution of a) Jun-Sept SI and b) annual SI over the sub-divisions. As mentioned earlier low value of SI indicates that the type rainfall region with shorter dry season and high value indicates most of the rain occurs within few months (2-3 months). An increasing trend in SI values for the period 1951 to 2015 of the Uttaranchal, Himachal Pradesh, East Rajasthan, West Madhya Pradesh, Gujarat region, Madhya Maharashtra, Marathwada, Chattisgarh, Tamil Nadu, considered being serious from agricultural point of view. The analysis of rainfall for 65 years (1951-2015) over the 34 sub-divisions inside the India has been carried out to know the seasonal and annual variation in rainfall in view of changes due to global warming. The analysis clearly showed the climate change impact on northwest sub-divisions of the country showing increase in SI values leading to dryness during the monsoon season. Significant decreasing trend in monthly, seasonal and annual rainfall has also been noticed in 22 sub-divisions of mostly in the northwest, north, extreme eastern, central and peninsular India, except coastal region. Along the west coast except Konkan-Goa sub-division and to east coast except Tamil Nadu- Pondicherry sub-division, rest of the sub-divisions showed increasing trend in rainfall. In the extreme north only Jammu &Kashmir sub-division showed increasing trend. Analysis showed that lower the seasonality index value better is the distribution of monthly rainfall among the months of the year. Average annual seasonality index for 34 sub- divisions varied in the range 0.59 over Jammu & Kashmir to 1.31 over Gujarat region, Saurashtra and Kutch region. The seasonal variation in SI ranged 0.19 (Nagaland, Manipur, Mizoram, Tripura) to 0.59 (Jammu & Kashmir). This indicates that rainfall is markedly seasonal with a long dry season and most rainfall occurs in less than 3 months. Of the 34 sub- divisions, seventeen sub-divisions especially in the central longitudinal belt noted increasing trend in SI. An increasing trend in seasonality index is thus an indicator of alarming situation for the agriculture and may cause shifts in the timings of plant activities with heavy concern on water resource management. It is seen from the study that analysis of seasonality index helps to have an idea about the distribution of the rainfall among the months. To understand this, it is necessary to identify changes in all aspects of seasonality to meet the water resources shortages especially in dry regions. Authors are thankful to Director, IITM, Pune for his keen interest and encouragement for carrying out this study. Authors express their sincere thanks to the Ministry of Earth Sciences (MOES) and India Met. Dept. (IMD), Pune for making available the relevant rainfall data. Livada I, Asimakopoulos DN. Individual seasonality index of rainfall regimes in Greece. Clim Res 2005; 28: 155-61. Barry RG, Perry AH. Synoptic climatology; methods and applications. London: Methuen 1973. Walter MW. Length of the rainy season in Nigeria, Nigeria Geog J 1967; 10: 127-8. Walsh RPD, Lawer DM. Rainfall seasonality: Description, spatial patterns and change through time. Weather 1981; 36(7): 201-8. Adejuwon JO. Rainfall seasonality in the Niger Delta Belt, Nigeria. J Geogr Reg Plann 2012; 5(2): 51-60. Guhathakurta P, Rajeevan M. Trends in the rainfall pattern over India. Int J Climatol 2007; 28(11): 1453-69. Guhatakurta P, Saji E. Trends and variability of monthly, seasonal and annual rainfall for the districts of Maharashtra and spatial analysis of seasonality index in identifying the changes in rainfall regime, 2012; Research Report No.1/2012, IMD Pune Publ. 1-26. Patil MK. Change in Seasonality Index of rainfall in Sangli district. India Streams Res J 2015; 5(1): 1-7. Markham CG. Seasonality of precipitation in the United States. Am Assoc Geogr 1970; 60: 593-7. Finkelstein PL, Truppi LE. Spatial distribution of precipitation seasonality in the United States. J Clim 1991; 4(4): 373-85. Sumer G, Homar V, Ramis C. Precipitation seasonality in eastern and southern coastal Spain. Int J Climatol 2001; 21(2): 219-47. Kanellopoulou EA. Spatial distribution of rainfall seasonality in Greece. Weather 2002; 57(6): 215-9. Feng X. Porporato A, Rodriguez-Iturbe I. Changes in rainfall seasonality in the tropics. Nat Clim Chang 2013; 3: 811-5. Bari SH, Hussain MM, Husna N-E. Rainfall variability and seasonality in northern Bangladesh, Theo and App 2016; 1-7. Singh RB, Mal S. Trends and variability of monsoon and other rainfall seasons in western Himalaya, India. Atmos Sci Lett 2014; 15: 218-26. Cheung WH, Senay GB, Singh A. Trends and spatial distribution of annual and seasonal rainfall in Ethiopia. Int J Climatol 2008; 28: 1723-34.